Quadmo747 - SLN Technologies Pvt Ltd. The new Quadmo747 board is the new Qseven™ platform designed by SECO on Intel® Atom™ architecture. SECO is a founding member of Qseven™ Consortium. The ARCNET protocol is the ideal solution for applications such as industrial control, building automation, transportation, robotics and gaming. ARCNET is simple to use, low-cost, extremely ruggedand high performing. The SECO104-CX700M is a PC/104-Plus CPU module based on VIA EDEN™ V4 LV/ULV CPUs from the LV at 400 MHz up to the ULV at 1.0 GHz that have best performance/power rates in the market. The SECO104-CX700M integrates the VIA CX700M™ chipset that utilizes VIA UniChrome™ Pro Integrated Graphics Processor (IGP), with integrated MPEG-2, MPPEG-4 and WMV9 Hardware decoder, ensuring optimal performance for all multimedia, entertainment, and productivity applications. Internal data flow is equivalent to the latest AGP 8X graphics cards. For perfect multimedia support, the M693R offers also Multi-configuration LVDS transmitter, Dual display support and a perfect audio, thanks to the acclaimed VIA Vinyl HD Audio suite. Supporting memories of DDR2 533/400/333 type up to 1GB on SODIMM socket and 1 Serial ATA device, the SECO104-CX700M has the I/O on-board connectors suitable for most of the embedded systems: 2 serial ports, 1 parallel, 2 USB 2.0, 1 Ethernet port 10/100BaseT and the PC/104-Plus format gives the possibility for many additional features of the embedded system. All this also in fanless operation. The M435R module (such as M440R) is an ARCNET network interface module based on COM20020 controller and is an ideal solution for applications such as industrial control, building automation, transportation, robotics and gaming. For extended functionality, moreover, the M435R module is provided with 8 programmable Outputs and 4 standard RS-232C Full modem serial ports. Each of these serial ports can be configured to use standard addresses for COMS ports or can be software configured to be mapped at user chosen addresses. Also the IRQ’s can be SW configured, so that the ports can use different IRQ lines or share an unique line. The M585R module is a new PC/104-Plus CPU module based on the Intel® Celeron® Ultra Low Voltage 400 and 650 MHz processors. The module uses the VIA ProSavage Twister T (PN133T) chipset with integrated Savage4 2D/3D Video Accelerator and supports 4X AGP VGA/LCD interface and up to 32 MB video memory. The module also integrates the VIA enhanced audio, 2 serials, 2 USB ports, 1 parallel, up to 512 MB SDRAM, 10/100BaseT Ethernet, EIDE interface (with the possibility to use IDE Flash Disks up to 2GB), keyboard/mouse controllers, Real Time Clock and Watch Dog Timer. It is able to communicate with other peripheral boards via ISA-Bus (PC/104) and also via PCI-Bus (PC/104-Plus). The MTS690R is a very compact module that allows the control of a 4 wire resistive touch screen. The touchscreen can be configured to work in a relative (i.e., similar to mouse functioning) or in absolute mode (i.e., the controller recognises the co-ordinates of the pressure on the touch screen). In relative mode, the standard PS/2 interface allows to the user to use standard mouse drivers provided with his Operating System, while absolute mode drivers are supplied with the module. The M437R module (such as M441R) is a low-cost, CAN Bus interface board that provides access to a wide range of CAN applications for PC/104 systems. The module is based on the Intel CAN controller 82527. 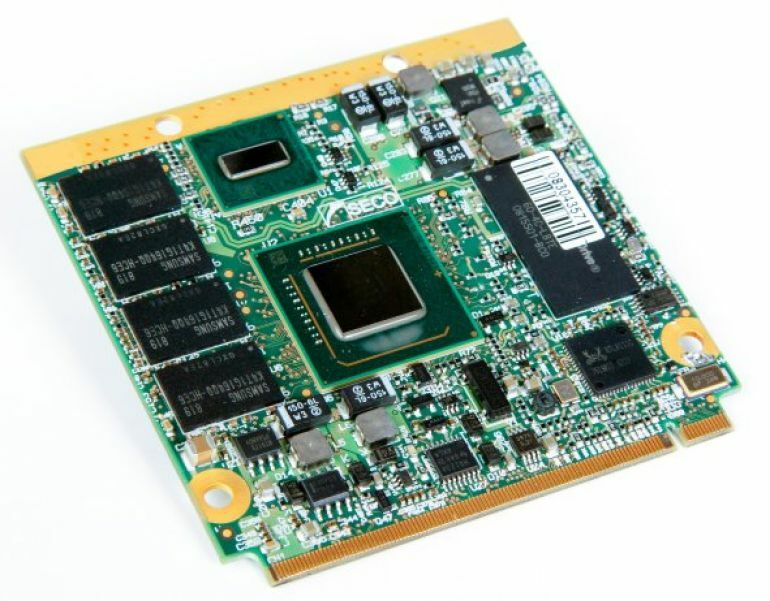 The SECOMX-945 is an XTX form factor module that SECO designs with the Intel® Celeron® M, Core® Duo, Core® 2 Duo processors with Intel® 945GME chipset. The board features also Audio, SATA (2x) and IDE Interfaces, Ethernet 10/100BaseT, 6x USB 2.0, keyboard/mouse PS/2, Real Time Clock and Watch Dog Timer.